This Bedtime Bear is just too cute and it's sure to put a smile on your face as you create with it. 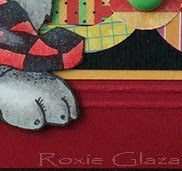 Prismacolor pencils were used to color the image and I used the out of the box technique to help him fit the size panel I wanted to use. The grid on the base was created with the Scor-Pal. Ink distressing was done on all the layers except the image panel and very little on the sentiment panel which I printed on the computer and cut out with Spellbinders Nestabilities. This post is really late! 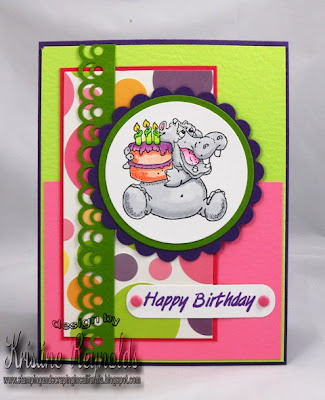 I had pre-scheduled it to post while I was at CHA today but it didn't post correctly and I had to wait till I could get to my laptop to fix it....so with out further ado, here is my Birthday "Hippo" card. Do you notice anything strange about my "hippo"? I thought he was really cute until I went to like the image that I used and realized that he's called "birthday Gator"...yes, you heard right...he's a gator...well, if you color him grey he looks like a hippos doesn't he? I'm going to have to color him green on the next card I guess! Maybe we will find out that he is just that versatile of a stamp? I would have redone him but I think the card turned out really cute and if I hadn't told you I bet you wouldn't have noticed, huh? I've had a few of these days so I can feel for this old cow! -Prismacolor pencils for color on the image. -Stickles were applied to the white dots on the black, blue flower centers on the yellow and the moon. -Faux brads were cut out with the Tiny Tags die from Cuttlebug. They are attached with Aleene’s tacky glue. -The scalloped edge is cut with the Garden Trellis punch from Martha Stewart; I used a narrow strip of cardstock to punch just the scallops. The sentiment you see on the front of the card and inside are on the same image. I masked off the rubber with sticky notes to ink up the line/lines I wanted to stamp. The periods were added with a marker. Wooohooo!!! Thanks to all of you who hopped along with us last weekend. We really enjoy seeing all your comments, and sharing the wonderful QKR Stampede images with you. Please contact Maribeth to claim your prize. Hi there! I hope you enjoyed our hop last weekend. I will be back later today with the winner of the $20 gift certificate...I wonder who will be the lucky hopper??? For now I wanted to share a card with you I made using the Snowman Scene image. I just love this stamp. It is such a cute image, and totally makes a card just by itself! The image measures 4 1/2 x 4 1/2...so the card I made with it is a 5x5 card. I stamped the image, and colored with watercolor crayons. Just like that, it is super cute! This is also the image I used on the tissue box cover I shared awhile back. I trimmed it down, and layered onto some patterned paper. I wanted to add a little sparkle, so I used some fine flecked glitter on the ball of the hat. That is it...that easy...or "Easy Peasy" as my 3 year old says...lol. There is really so much you can do with this scene, or the other snowman scene in the Snowman section of the QKR Stampede store. Check it out! Eureka Stamps is another part of QKR Stampede -God Gives Us Music is a wonderful size stamp to make a quick card. I had this pattern piece of paper in my stash and used it for the background. The black gem swirl is from Prima. The black checked ribbon is from Really Reasonable Ribbon. I cut the card stock and the stamped image out of a Spellbinder book shape. We have already the 4th Tuesday of the month and that is my day, that I can show you a card. 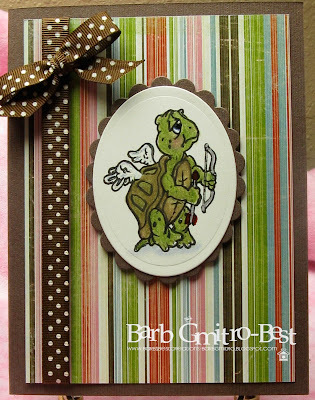 Today I show you a card with the cute turtle from QKR Stampede. She is so cute. I love this image. The name of this image is "In Love". I have not done a sentiment on the card, because I do not know when I'll need it. So I have all the possibilities before me - for a birthday, Valentine's Day or any other occasion. I colored the turtle with watercolor pencils and I wiped with turpentine. The flowers were too small for the pencils, so I have painted this with Distress Ink. 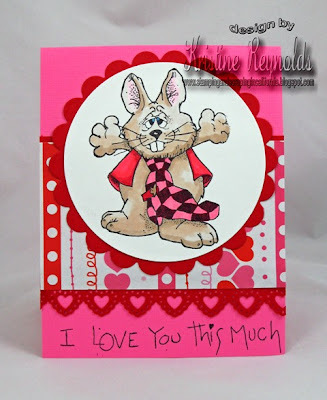 Did you get a chance to hop through our Valentine's Blog Hop? It's worth doing, not only because there are some amazing projects to see along the way-but also because if you leave a comment on all the blogs along the hop you will be entered for a chance to win a $20 gift certificate to the QKR Stampede store! But before you run off to do that I want you to see the projects I have to share with you today. 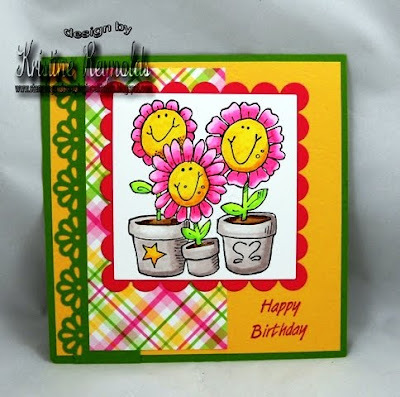 I made a few quick birthday cards with "Smiling Flowers" because my stash of birthday cards was running low. The sentiment is from "Happy Birthday". I hope you enjoyed my cards today...now go check out the HOP!!! Being such a huge animal lover this little doggy 'Good Boy' stole my heart as soon as I saw him. I have coloured him with Copics mounted him onto card and attached the sentiment also available from QKR Stampede and added a large heart. Thanks for looking. WELCOME to the QKR Stampede "Valentine's Day Blog Hop"! We are so excited to show you what we created for this FUN Blog Hop and SO glad you have come to join in on the FUN! 4. For another chance, spread the word about our Blog Hop on your blog. Be sure to leave a comment here telling us you did that. The Deadline for entry will be Wednesday, January 26th at midnight EST. We will announce the winner on Thursday, January 27th on the QKR Stampede Blog. Now it is time to see some awesome QKR Stampede projects featuring the Valentine's images. Check out the Valentine's Images at the QKR Stampede Store HERE. Hello crafty friends! Today I am showing you a Post It Note holder that I made using the Girl with Balloon (#4901) image from QKR Stampede. When I saw her I thought she was so sweet and had to have her. I stamped the image onto white card stock and colored her with water color pencils. 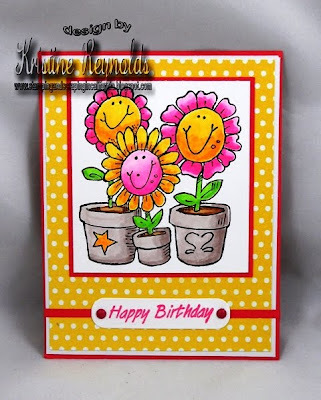 I punched the design into the right side with the EKSuccess Flower and Flourish Edger Punch. This was then layered onto pink card stock. I wanted this to have a generic greeting, so I cut one of my stamps into separate words. (GASP!) 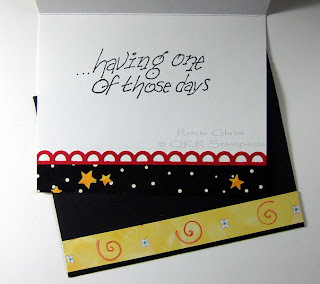 I used the Happy Father's Day stamp, in pieces to stamp the Happy Day onto white card stock. 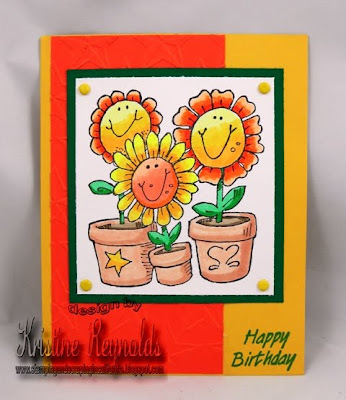 This is from the Happy Birthday Set (#22803) from QKR Stampede. Once that Happy Day greeting was adhered to the pink card stock I trimmed it all down and used foam mounting tape to adhere it to the top of the note holder. ﻿Here is a view of the inside of the note holder. I plan to keep it right on my crafting table for quick notes or to use the post its to mask areas on projects when I am stamping. Thanks for stopping to see my project, I hope you like it. Leave a comment and let us know what you think. Be sure to come back tomorrow for the Design Team Valentines Blog Hop. I'm sure all the gals will have some wonderful projects for you to see. Today's card feature the adorable CUPID turtle. QKR has the cutest turtle images around!! Background paper is from Bo Bunny. I kept the card pretty simple to really spotlight the image. I colored with colored pencil and blended with Gamsol mineral spirits. January is half over and its almost Valentines day so I have started working on my valentines cards. 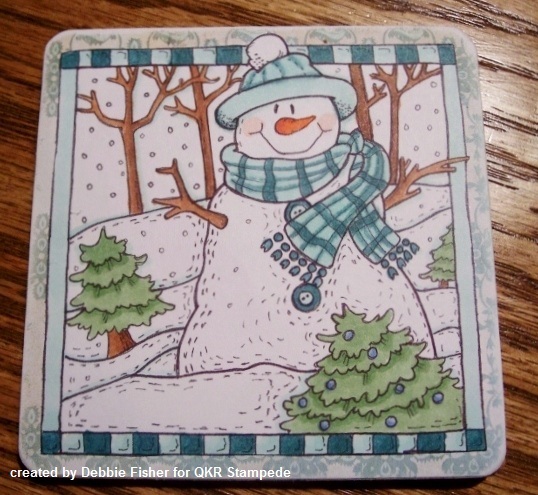 This one uses this cute ragdoll stamp from QKR Stampede Love You. This twitterpated bear was such fun to work with. After seeing my card a friend purchased the digi image and she made him look so cute in a larger size. He also comes with a heart in the background in both rubber and digi images. -Prismacolor pencils were used to color the image and blender pen with chalk for the blue surrounding the image. -The small hearts on the floral paper are from a Fiskars hand held punch and glued to the card with Aleene's tacky glue. -The EK Success hearts were layered white on red with glue for adhesive then punched with a button hole punch (double holes on one punch). I tied the baker’s twine onto the heart and they are mounted with heavy carpet tape. -The sentiment is a partail image. I masked off the rubber to ink up I Love and stamped it, the You was stamped seperately so I could move it to the right. Hello there. Happy Thursday. I hope you are doing well, and enjoying the month of January so far. Snow is in the air...even in parts of the USA it usually isn't. My family has been enjoying the winter with some sledding, and shoveling...or wait...I guess we don't like the shoveling part...lol. 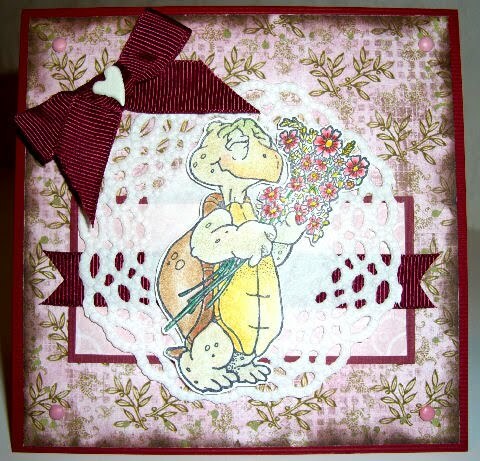 Well today I wanted to share a card I made using the Totally in Love image. I think this image is so cute! Well what do you think? This is another one of those great QKR Stampede images that is very versatile. Yes...it is found in the Valentine's section of the QKR Stampede store, BUT...don't you think this would be great for an anniversary or wedding...maybe stick a little vail on that lady snail...lol. The possibilities are endless! This is just one of the great Valentine's images available from QKR Stampede. I know the other ladies have been showing some of them to you too, but head on over to the store and check them out for yourselves too! AND..don't' forget to join us next Friday 1/21/11 for a Valentine's Day Blog Hop...QKR Style! Hello Everyone! Dawn here again with a new card to share.I find I am always short on thinking of you, and Sympathy cards. I made two versions of this to add to my stock of cards. This first one is in a soft blue accent. Eureka Stamps is another part of QKR Stampede -God Gives Us Music is a wonderful size stamp to make a quick card.I also used Pine cone accent that I colored with my Copic markers, fussy cut and pop dotted to add dimension. This second card I used a soft gray to accent. I wish you all a happy and creative New Year. 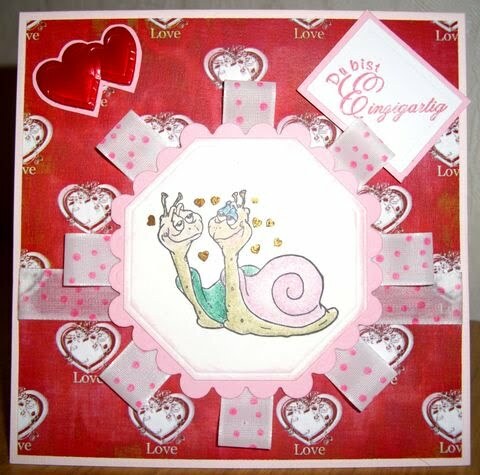 This is my first post this year and I am so happy, that I can show you today the love snail pair. The image from QKR Stampede is Totally in Love. The both snails are so cute. I love them. I colored the stamp with watercolor pencils and wiped with turpentine. After a week of travelling for work I am really looking forward to a day at home with the family and hopefully a little bit of time to stamp! Yesterday I had just enough time to make this quick and easy card. It's the perfect card for any of those special loved ones in your life! 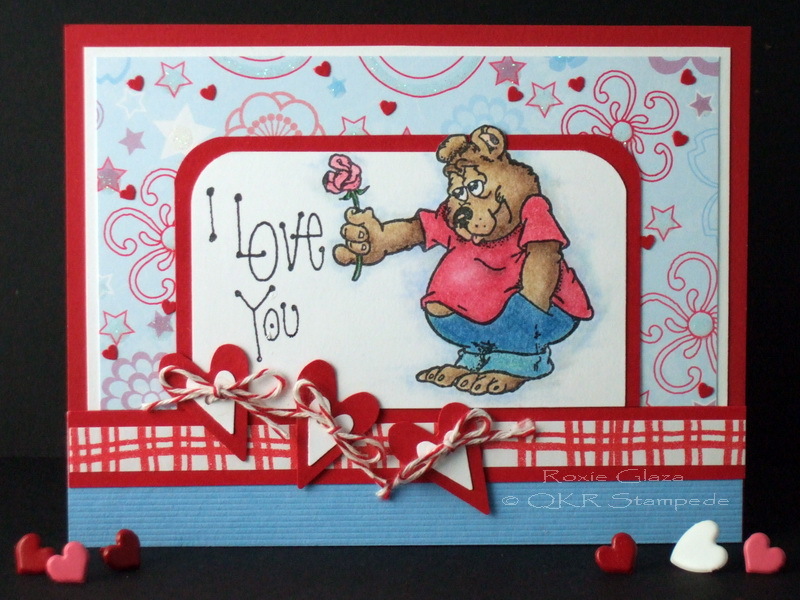 There are many more fun valentine stamps at the QKR Stampede Store. So go chick them out! I have coloured him with Copics and added a stamped sentiment, the papers are Basic Grey, I have also added some shiny red card candy, gingham ribbon, flowers and a red heart punched out using my SU punch. We are very near the Valentine celebrations but cards of love are perfect for an everyday card. Hello crafty friends! 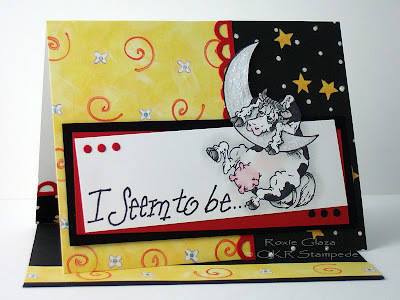 Today I'm showing you a card I made with an adorable image from QKR Stampede. I stamped this cute little guy onto white card stock and colored him with watercolor pencils, then did a bit of fussy cutting around him. 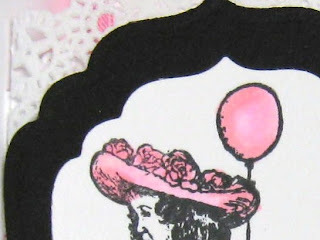 I used a heart shaped doily and adhered it to the card with tape runner, then cut the extra away. 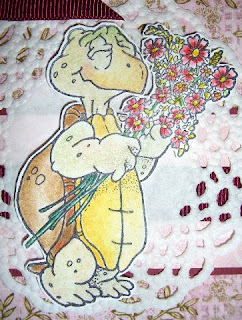 I stamped "You're Huggable" onto the doily, this is another QKR Stampede image. I then used foam tape to add the image to the card. I used a white gel pen for the dots and dashes around the edge of the card. Here is a close up picture of this cute little guy's belly and ears. It looks like Flower Soft doesn't it? Well, it isn't. I simply took a styrofoam ball, cut it in half and rubbed the 2 halves together. This causes it to crumble and it looks a lot like Flower Soft. Easy peasy! I used glue on his belly and ears and then covered it with the crumbles, worked great and at a fraction of the cost of Flower Soft. I haven't tried coloring it yet, but I have heard that a couple drops of ink, some ink spray or even food coloring works well. Thanks for stopping by the QKR Stampede blog today, I hope you have been inspired. Be sure to check out the QKR Stampede Store to see all the wonderful image they offer, both in rubber stamps and digital. Become a follower if you aren't already and leave us a comment and let us know what you think. 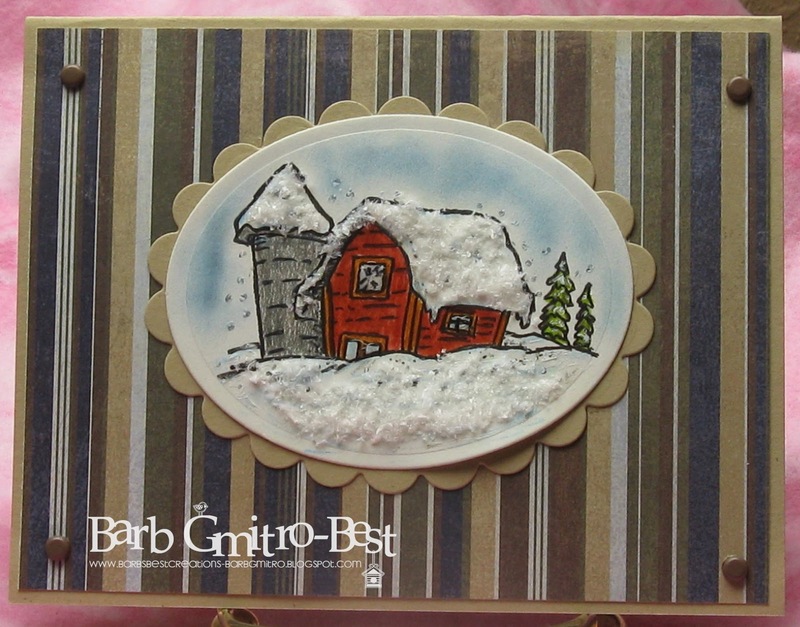 I used the stamp Snowy Barn for my post today. for the sky and Flower Soft for the snow. something I've had in my stash for a while. I hope you will head on over to the QKR website and do some shopping! Lots of great stamps available there! Today for my QKR Stampede project, I have made a coaster. 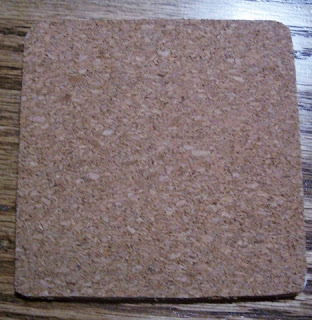 My LSS carries these 4" coasters and I have several of them. 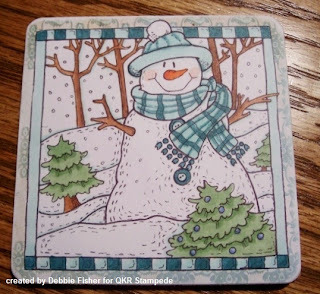 I used the digital image Snowman Scene, shrunk it down to fit my coaster and colored with Copic. I cut a piece of Basic Grey paper to fit my coaster and adhered with Tombow's Mono Aqua Liquid Glue. Then I adhered my image. 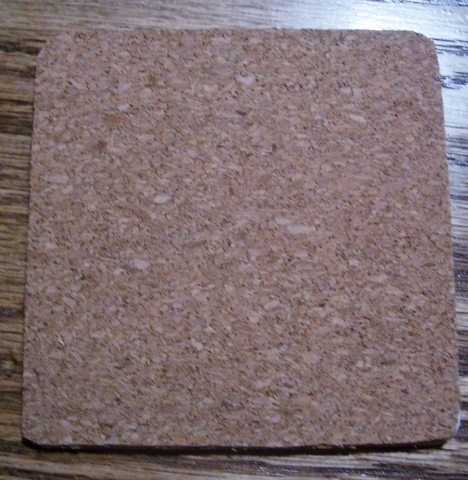 On the back I cut a piece of cork and adhered it with the same glue. It's not shown in the picture, but I will add a piece of clear contact paper to the image front to protect it. This with a mug and some hot chocolate would make a wonderful gift.